Saturday Club Night With DJ Shafi is an event that took place on 06-Dec-2014 in Hyderabad. 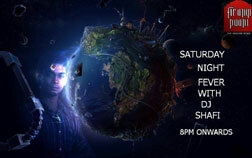 Be the first to comment on Saturday Club Night With DJ Shafi! Just use the simple form below. fullhyd.com has 700,000+ monthly visits. Tell Hyderabad what you feel about Saturday Club Night With DJ Shafi! Global Congress On "Corporate Social Responsibility (CSR)"